It’s that time of the year when most ELA teachers are looking to get serious about writing instruction. Maybe this is point where you start thinking about assigning a capstone-like writing project. And in the coming months you plan to block out a significant portion of your calendar to get your students ready. But your beginning to feel a creeping anxiety as the time approaches. You remember all the missteps the students have taken in recent years. And though you have improved your writing instruction over time, the progress your students have made really hasn’t been as quick or as transformative as you had hoped. This was me every year for the first ten years of teaching. I would teach students skills in a steady progression, getting them ready for that big writing assignment. Every year, I would get a little better at explaining and preparing for the inevitable gaps in their understanding and skill. And each year, it would get slightly better. Honestly, I didn’t trust that assigning a large amount of low-stakes writing would really work. But when I had tried everything else, and it wasn’t going how I pictured, why not? “So, I just assign more writing?” Well, yes. And no. Yes, it is about assigning more writing, but there are some considerations. 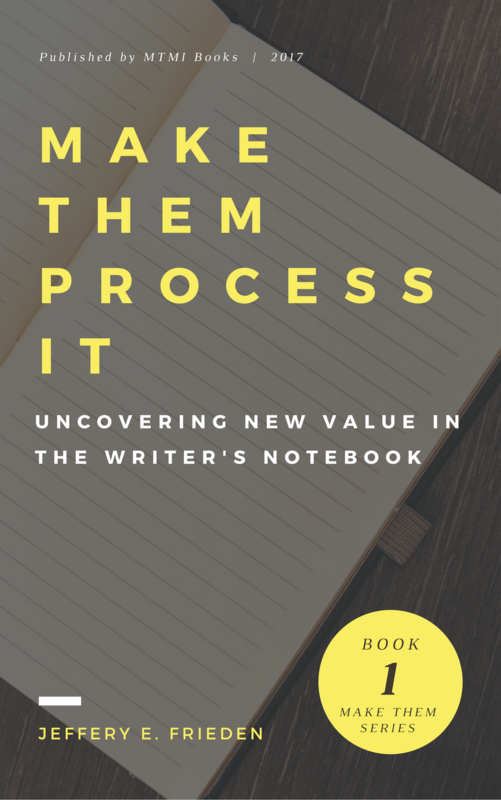 At the time I decided to heap on the low-stakes writing assignments, I had been hearing for quite some time that I should have my students keep a Writer’s Notebook. I tried this several times and failed. But a few years ago I discovered how to make it work all year long. And it did improve my students’ writing ability and confidence, especially when it came to high-stakes assignments. 1. REGULAR PRACTICE. With anything worth developing skill, one must practice, practice, practice! This is especially true of writing. There has been this trend developing in education in recent years that we must measure everything we assign and teach. And because of that belief, tasks that involved writing became increasingly higher stakes, simply because of the conviction that everything must be measured with increasing rigor. Instruction and assessment grew more and more exhausting. One of the consequences that came out of this inane practice was fewer writing assignments. I gave my students their freedom back. They can, within set parameters, write about whatever they want. And they can produce a lot bad writing, consequence free. And I also gave myself permission to NOT GRADE EVERY LITTLE THING they turn in. Along the way toward filling up their Writer’s Notebooks, I will teach them about how to compose by the rules and to write with style. I will also teach them to revise their work according to these rules and style. But they must practice. They must practice almost daily: five entries a week, and five revisions per 15 low-stakes drafts. 2. FAMILIARITY. When my students engage in regular, low-stakes writing, turning ideas into words in an organized pattern, sequence, or logical organization becomes a familiar thing. Like wearing a pair of jeans. Over time, it gets comfortable. Writing no longer seems like a daunting, soul-sucking task. For them, sometimes writing can even be fun and rewarding. Eventually, my students get to the point where they can crank out a couple hundred words in under ten minutes. And it was the regular (and admittedly reluctant, at times) practice that caused this level of familiarity. 3. MUSCLE MEMORY. After practicing to the point of developing a familiarity with writing, my students develop muscle memory, so to speak. They hit a point where they don’t get tripped up by the moves of putting sentences together, one after the next. When there is comfort and confidence in a student knowing that he has a good grasp of how to move his thought from one sentence to the next, he does not have to think about mechanics and wording. He is free to use his writing to really think and communicate his perspective well. 4. LONGEVITY. After practicing to the point of developing a familiarity with writing, my students establish a certain level of longevity: they can sustain a line of thinking for a longer period of time. After lots of practice, developing familiarity, and achieving muscle memory, students are in good shape and can last much longer on a certain line of thinking. In a lot of ways, the practice has shaped them and developed them to the point where they no longer need to spend any of their energy thinking about how their sentences will come together. Instead, they can concentrate and focus their energy on how a line of thinking develops. They can work on arguing a point, comparing two ideas, contrasting two cases, defining a concept, and delivering a clever anecdote in the service of making a convincing case. Assigning a regular diet of low-stakes writing has done more to further my students’ writing ability than any of the adjustments, tweaks, and even overhauls I have done to my teaching over the years. There is just something about the regular practice of a thing that develops a deep and lasting skill. It’s a little counter-intuitive. It’s as if the more you pile on, the more it frees them up. QUESTION: How much pressure do you you think is put on your students from the writing tasks you assign? Let us know in a reply below!